Originally published under the title "Why Trump's Bid to Amplify Muslim Reformers Will Keep Americans Safer." 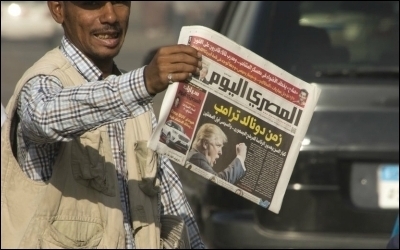 A vendor in Cairo sells newspapers with the Arabic headline "Donald Trump era" on November 10. President-elect Donald Trump pledged during his last major foreign policy speech before the election to "be a friend to all moderate Muslim reformers in the Middle East" and "amplify their voices." President Abdel Fattah el-Sisi and most of the political and media establishment in Egypt warmly embraced this policy. After meeting with the Republican nominee in New YorkCity in September, Sisi told CNN he had "no doubt" Trump would make a strong leader. Sisi was also the first Arab leader to telephone Trump after his election win. Egyptian President Abdel Fattah el-Sisi has called for an Islamic reformation. Since coming to power in 2013, Sisi has spoken passionately about the need for an Islamic reformation. For Sisi, Islamism isn't merely a ruinously bad blueprint for modern governance and a chronic source of security threats, it is also a wedge fueling outside hostility to Muslims, both Islamists and non-Islamists alike. In a 2015 New Year's Day speech at al-Azhar University, the world's most prestigious seat of Sunni Islamic learning, Sisi warned that the "corpus of [Islamic] texts and ideas that we have sacralized over the years" are "antagonizing the entire world" and "caus[ing] the entire umma [Muslim world] to be a source of anxiety, danger, killing and destruction." Not surprisingly, Sisi has faced opposition in the region, especially from Turkey, Qatar, and powerful figures in the Saudi royal family, who have opened their media to Brotherhood operatives to attack Sisi and even call for his assassination. One of the only Arab governments openly backing Sisi's uncompromising stance on Islamists is the United Arab Emirates (UAE), which in 2014 designated the Muslim Brotherhood as a terrorist organization (along with two of its U.S.-based affiliates, the Council on American-Islamic Relations and the Muslim American Society). Trump's campaign expressed "strong support for Egypt's war on terrorism." Within Egypt, Sisi's calls for a religious revolution have made him extremely popular, but he has faced fierce resistance from Islamists, who still dominate many sectors of Egyptian civil society and exert influence in government, particularly the judiciary. Sisi's supporters say the Obama administration's tolerance of Islamism and harsh criticism of Egypt's counter-terrorism efforts have been an enormous obstacle. In contrast, Trump's campaign expressed "strong support for Egypt's war on terrorism" and pledged that "under a Trump Administration, the United States of America will be a loyal friend, not simply an ally, that Egypt can count on in the days and years ahead." Walid Phares, a foreign policy advisor for the president-elect, stated in an interview that Trump will work to pass legislation designating the Muslim Brotherhood as a terrorist organization. Trump's election appears to have emboldened Sisi to step up his Islamic reformation campaign. Trump's election appears to have emboldened Sisi to step up his Islamic reformation campaign. Just days later, Sisi pardoned 82 prisoners, among them Islam Behery, a former TV host and prominent leader of a growing neo-Mu'tazilah-style movement that claims Islamic scriptures are man-made and should not overrule reason and critical thinking. Behery's movement has gained sweeping popularity as horrors committed by Al-Qaeda, Islamic State, and other Sunni jihadist groups have mounted in recent years.